I just had time to process and upload my photos to Flickr before rushing off again on Saturday on LMS business, this time in preparation for the Walsingham Walking Pilgrimage among other things. 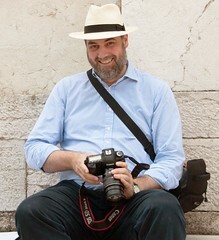 Details are being finalised; the indefatigable Paul Smeaton has actually walked some of the route to check it all out. 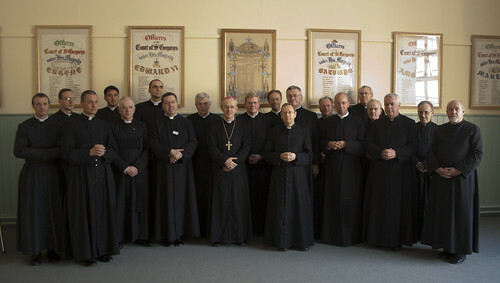 I'm glad to see a good number of bloggers have already posted either my pictures or Leo Darroch's - thanks Fr Ray (who was actually there), Fr Tim, Fr Michael Brown, Fr John Boyle, and anyone else I've missed. The Downside conference was really wonderful. 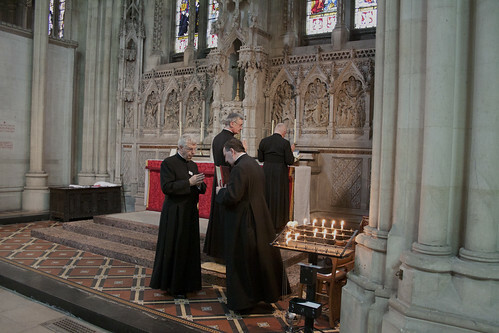 The Abbey is a marvellous place to have the training and private Masses; there are about a dozen side altars, and the sacristy knocks London Colney's into a cocked hat: it is actually set up for dozens of priests to say Masses, and not just four or five. Here are some pictures of the training itself. 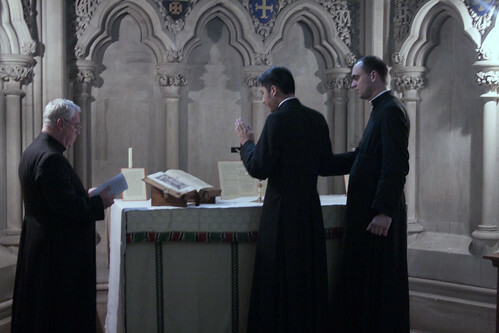 On the left is Canon Tuckwell, Administrator of Westminster Cathedral, learning the Traditional Mass. 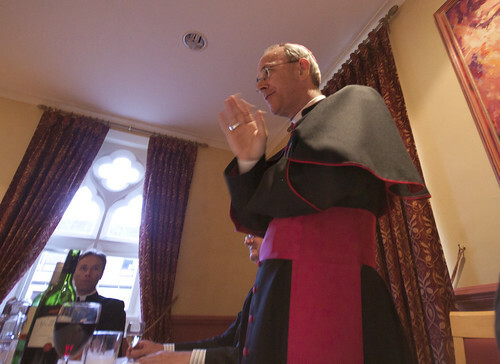 The priests were addressed by Bishop Athanasius Schneider, the Kazakstan-based author of 'Dominus Est', which addresses the question of the manner of receiving communion. He also gave a very fascinating speach after dinner, in part about his experiences in Kazackstan. Not only priests, but also a group of servers were being trained. A great many servers are needed each morning (ideally) to serve the private Masses, so this initiative, under the banner of the Society of St Tarcisius, made a lot of sense. 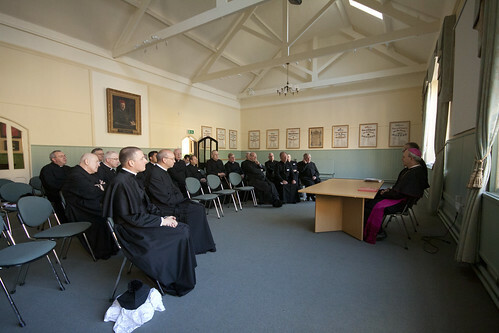 The conference was attended by 20 trainee priests; the trainers included Fr Andrew Southwell, the LMS' National Chaplain, Fr Bede Rowe, the LMS Chaplain for the South West, Fr Armand de Malleray FSSP (joined by The Rev Matthew McCarthy, an FSSP Seminarian), and Fr Kunkel ICKSP. 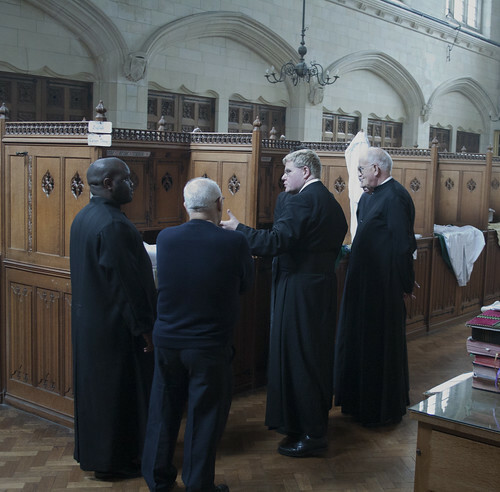 I think this is the fist time that LMS Chaplains and priests from both of these great traditional priestly societies have collaborated in a training event of this kind.